The city has been quite efficient on this one. The above slide came from a presentation that was to be made to city council. Before city council even considered the issue the project was removed from the city’s list of bond projects. This entry was posted on Tuesday, February 5th, 2019 at 5:00 AM and is filed under City government. You can follow any responses to this entry through the RSS 2.0 feed. You can leave a response, or trackback from your own site. 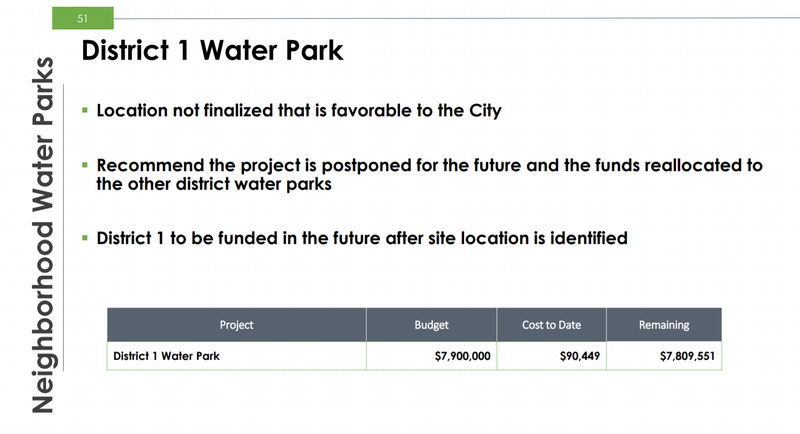 I thought the CC did away with the D1 water park to reprogram the money to increase the scope of the west side Natatorium per request of some the of D1 residents. I’m sure it has nothing to do with the announcement of Great Wolf and a water park at Cohen Stadium. Who benefited from the $90,466 spent on a project that will not happen? Mayor and Council and above all our City management are very bad stewards of tax money, bad, very bad. I see the City has a bid out for the demolition of Cohen Stadium, another use of tax dollars I certainly did not approve. In El Taxo WE never know what happens to all the money. Contracts, construction, “projects” that are “Created” by “Somebody” and they never end or ever have any ACCOUNTABILITY to US. They, whoever “THEY” are in El Taxo hire “contractors”. Apparently in El Taxo a “Contractor” is just “Friends, family”, “Uncle Joe, Cousin Waldo”, showing up with a shovel, a pick up and wheel barrow. Why did POLITICIANS blow-off MILLIONS on building a ball field for a BILLIONAIRE and FORCING taxpayers to pay for it??. The “Organization” could have simply renovated, even torn down, rebuilt at the Cohen Stadium location. Why didn’t they?? Inherent POLITICAL corruption in El Taxo. Who or what puts the most MONEY into politicians POCKETS?? That is what every “Project”, event, venue in El Taxo is based on. And the idea, fact that THEY can, will always TAKE MORE from US. It is fairly obvious that it had NOTHING TO DO with making El Paso better for all of the citizens. It had EVERYTHING TO DO with making the hotel properties downtown and the upcoming office buildings and restoration projects increase in value, all of which were already owned or were targeted to be purchased by an “IN” group and are being highly subsidized by city and county tax incentives which have to be replaced by homeowners paying for those lost revenues. Building it where the less expensive and easier to access land was available never even entered their minds because it was a back room pre-planned deal that we never got to vote on in the first place. ALL of the water parks should be KILLED. A waste of TAXPAYER money. We thought there was a WATER shortage in El Taxo. Can the ignorant politicians “Create” more water?? The “High-Dollar “Official” that came up with this idiocy should be fired, saving US a little more money. Waste, tax, spend, waste some more, is all THEY know. 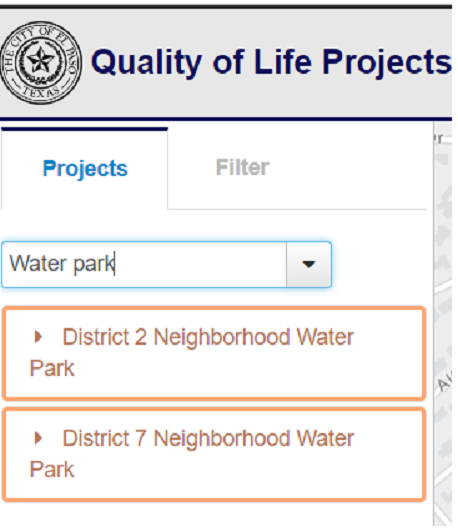 According to KVIA last night City Council is also planning to move money from streets over to water parks because supposedly all the street projects are under contract and there is money left over. From my perspective, the right thing to do would be to resurface more streets since years of neglect make streets our biggest infrastructure problem.